After departing from your last destination, the tour will be finished at the old port of Fira. After your disembarkation, in case you have a transfer service you will be guided to our bus in order to drive you back to your destination, otherwise you are free to take your own transport. Get ready for a good deal of walking. It was a well-organized trip, but many didn't seem prepared for the amount of walking required. We did a 1-hour trek up the volcano (right up to the peak), before we took a swim stop and the final pit-stop was for lunch. I got to know Santorini geological history via this tour. Thanks., Our guide was awesome! Great tours with magnificent views but get your hiking legs ready! 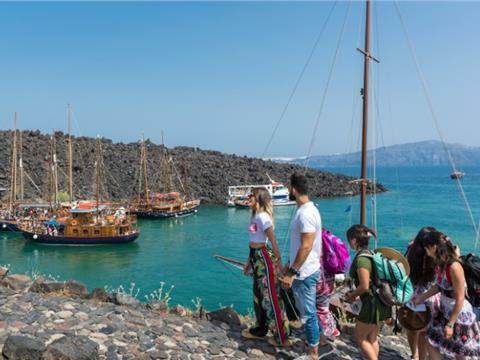 Was great experience with caldera's boats, the boats so beautiful, tour guide she kind and explain about volcano, we spend 6hr from fira, volcano, hot springs and the last is another island therisa. , A great experience! Nagyszerű élmény! , Jól szervezett! At first the thought of 6 hours spent between boat, volcano, hot springs and village sounded a bit of a whirlwind. However, on the day it flew by in a good way. The tour is well organised and allows the perfect time for each stop. The best bit is perhaps the value! It’s probably the best day out we had on Santorini and only €26. We had good advice from our host and took good shoes plus ‘old’ swimwear. The shoes for the climb and the swimwear for the sulphurous hot springs. Caldera Boats looked after us well and the guide, Leah, knew her stuff. A great experience!, Excellent!, Well organized!, A great experience!, Well organized! A great experience! Well organized! A must do. Guide was awesome! She helped her at every step and reach airport on time too. I really want to thank whole team in making the arrangements.